ffm – skyarena fuÃŸball wm 2006 (01), originally uploaded by bembelkandidat. I wasn’t able to take pictures myself, but this one here from Flickr shows the magnificent installation that was done in Frankfurt. 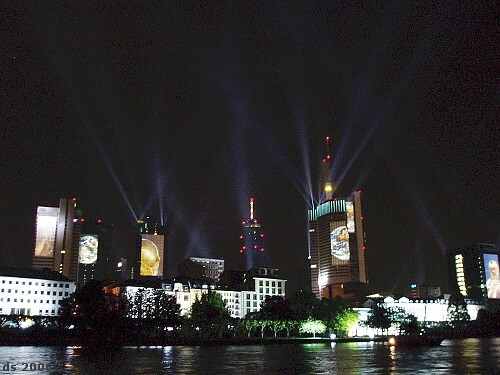 A video installation with 45 minutes of football history projected on to the skyscrapers of downtown Frankfurt. Absolutely amazing! Some more information about this huge project can be found here (in German). I have just opened up a new category: Football Worldcup. As things get chaotic here in Frankfurt due to the worldcup, there are also numerous ads and marketing things happening. I will try to display as many as I can in this category. On the 9th of July, when the worldcup is finished, this category shall be closed again. It’s completely web-based and the reader can flick through cards of content when reading the book. This way, the user can easily find content again, but the main benefit is that users can comment on specific parts of the book. it occurs to me that it would be really helpful to see an outline of the book. Not just the chapter titles you’ve got above the cards, but a more detailed outline. That way, your readers wouldn’t necessarily have to read every word before making a comment that might turn out to be premature.